I first saw this work on William Traver Gallery's web site, in early July 2000... a new show of Benjamin Edols' and Kathy Elliott's works was opening, and this was one of three works that were displayed on the web site. 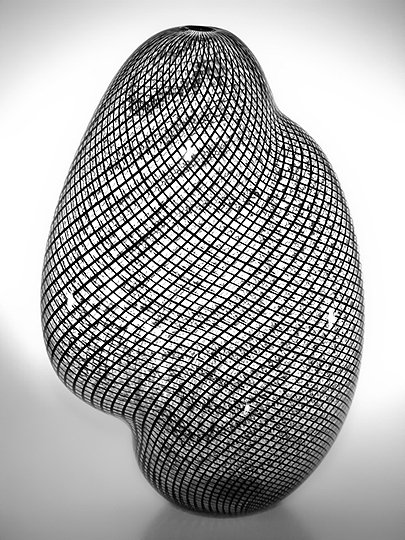 This work uses a very old technique called reticello (Italian for "little net"), in which filigreed canes are used to create some very cool effects within the glass. First, a vessel of clear glass is created on the end of a blowpipe. Then, the vessel is rolled through an array of thin glass canes that are laid parallel to each other. Next, the vessel is rolled through another array of parallel canes... this time, however, the canes are picked up onto the vessel at an angle to the first set of canes. In the case of this work, the result is a net of canes made up of diamond shapes... this is the reticello. Another layer of clear glass (a gather) is added to the outside of the vessel. 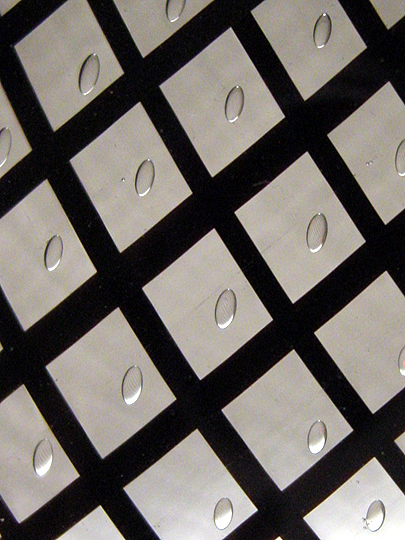 Because of the gaps in the reticello (created by the overlap of the two layers of canes) and the viscosity of the glass, a tiny bubble of air is trapped inside each diamond in the reticello. Finally, the entire vessel is blown and molded into shape. The air bubbles remain within the vessel... in fact, they stretch along with the vessel and all of the canes. In this work, the main vessel is clear glass, and the reticello is made of very thin, flat canes of black glass. From a distance, you can't really see the bubbles within the reticello... they don't appear until you get very close to the glass. However, their cumulative effect gives the work an extra sparkle that it wouldn't have otherwise. The interference patterns that appear when you look at this work from different angles are amazing. I really like this work... it's a very nice example of some classic glassworking techniques.